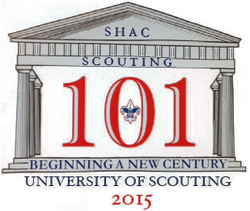 University of Scouting is designed to be a day of learning while having fun. Simply stated, it is the finest one-day supplemental training offered in the BSA - guaranteed to give you confidence and skills necessary for an exciting program. This training offers a variety of courses designed to give additional information to help in all areas and programs of the Boy Scouts of America.Some of the methods touched upon in different basic trainings are treated in greater depth at University of Scouting. There are no prerequisites as this training is intended to enrich your program experience. University of Scouting provides quality supplemental training to allow leaders to enhance and improve the program quality that they deliver and to have a positive impact on the youth of our council. University of Scouting is designed for all adult leaders in the Boy Scouts of America regardless of function or program area. Learn from these sessions and add quality to your program - GUARANTEED! Discover the opportunities available for meetings and outings. Learn about council activities to support your program. Visit the Scout Shop for your supplies. Learn more about Scouting's origins and the legacy of learning.